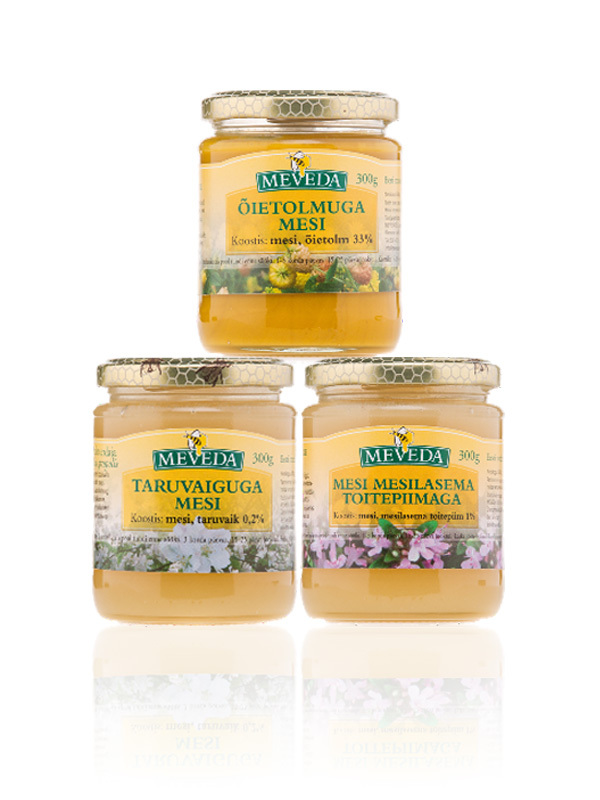 Meveda produces a range of speciality honey, each with a characteristic taste related to the dominant flowers within range of the bees. The three main types were envisaged as a gift pack of flower pollen dust, royal jelly, and propolis kinds of honey. As the product is 100% natural there was little need for ingredients text; instead, text was added to explain the proven health benefits of the type of honey, plus a serving suggestion text. A photograph related to the dominant flowers in the territory of the bees extends horizontally and blends into other label elements. This horizontal graphic element serves to unite the packs as a series, while also providing differentiation for each flavour. The arched curve of the brandmark is echoed by the label shape itself, thus focusing attention on the bee in the brandmark and the type of honey. The curved label visually adds volume to the pack and the various layers of design elements add to this effect.